The first star system colonised in a system is designated as the main Colony planet. All other planets that are colonised are designated as outposts. When a new environment is colonised (either a colony or an outpost), it has only an initial colony base. This produces housing for 1 unit of population, 1 food, 1 water and a small amount of energy. On the main colony planet, Housing type buildings can be built to allow the population to increase above 1 unit. Housing adds extra max population. Ocean and Swamp require Biospheres instead of Housing, Desert requires Thermostatic Biospheres and Tundra requires Thermalised Biospheres. Barren, Toxic and Molten environment types can never be increased beyond the initial 1 population unit. No other planet in the system can have a colony. The colony planet will be the only planet in a system where it's possible to build planetary defences such as Starbases, planetary shields etc. 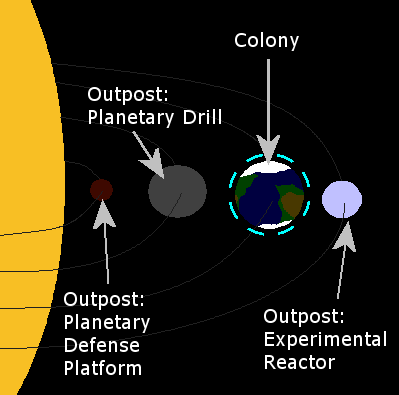 This system is designed to encourage the player to choose the most habitable world in the system for his initial colony. Although any planet can be chosen, population limits and the fact there's only one colony per system means that the best planet to colonise will always be the one with the best environment*size. Additionally, as population requires locally produced water to survive, only worlds on which water can be extracted will support more than 1 population anyway. Tier 1: Water Reclamation Infrastructure - Doubles water output of pumps on the planet. No penalty. Tier 2: Irrigation Infrastructure - Food per farmer +1, production per worker -1. Tier 3: Ecosystem Stabilisation - Food per farmer +2, production per worker -3. Tier 4: Gaia Conversion - A reaction that causes the planet's ecology to grow at an exponential rate. Benefit: Planet environment type increases to Terran, and Terran increases to Gaia. Penalty: Destroys all mineral nodes on the planet, effectively reducing it to ultra poor. Production Infrastructure: Industrialisation that allows a planet to build special stuff at the cost of decreased research and food production etc. Tier 1: Shipyards - Orbital shipyards added to the planet's starbase. Allows construction of ships larger than cruiser. Tier 2: Outpost Coordination - Decreases the cost for outpost infrastructure upgrades throughout the solar system and negates the effect of any blockades ever placed on the system's outposts. -1 research/scientist. Tier 4: Geosurvey - Discovers an additional 1-2 mineral deposits on the planet. Information Infrastructure: Makes improvements to planet-wide communications and education infrastructure, to improve research at the cost of farming and production. Tier 1: Internet - +1 research/scientist. Tier 2: Hypersynaptic Network - +1 research/scientist, -1 food/farmer, -1 production/worker. Tier 3: Planetary Supercomputer - +2 research/scientist, -1 food/farmer, -3 production/worker. Tier 4: Archeological Survey - Each mineral node has a 50% chance of becoming an Ancient Artifacts node and a 50% chance of just being destroyed. General Infrastructure: Makes generic improvements to planet with no penalties. Tier 1: Energy Efficiency - Doubles energy output of power plants. Tier 2: Breeding Programme - Doubles growth rate on the planet. Tier 3: Planetary Surveys - Increases size factor of planet by 1, allowing an additional housing unit to be built. Tier 4: Social Singularity - Multiple minor technological breakthroughs. +1 research/scientist, +1 food/farmer, +1 production/worker, morale+25%. Outposts can never increase beyond 1 population unit. Production, energy, research etc on an outpost is transferred to the main colony in the system. This is achieved by using simple system-wide resource pools. Outposts are intended as a cheap way to dominate strategic resources such as ultra rich planets, ancient artifacts, etc. To that end, outposts have access to special infrastructure upgrades that colonies don't have. Outposts can not make use of colony infrastructure upgrades. These are paths by which an outpost can be hyper-specialised to capitalise on special materials such as mineral rich planets, ancient artifacts, the cooling ability of a tundra planet, the unique properties of a toxic planet etc. Energy: This path yields successively higher energy output reactors at the cost of decimating production, research, water and food. Tier 2 and above requires a tundra environment. Tier 2: Deep Coolant Pipes: Energy output of experimental reactor at 300%, decreases output of other power plants to 0. Tier 3: Subterranean Coolant Injectors: Energy output of experimental reactor at 400%. Tier 4: Planetary Core Reactor: Converts the planet into a massive nuclear reactor cooler, increasing energy output of experimental reactor to 500% of normal. Destroys all mineral deposits on the planet. Production: This path yields successively higher material output per worker at the cost of decimating research, water, food and energy output. Tier 2 and above requires a Barren or Desert environment. All drills produce more if placed on a mineral node (see Buildings). Tier 1: Tectonic Drill: Mineral output of Tectonic Drills increased to 200% of normal. Tier 2: Seismic Chasms: Mineral output of Tectonic Drills increased to 300%, energy-50%, research-50%, food-50%, water-50%. Tier 3: Subterranean Shafts: Mineral output of Tectonic Drills increased to 400% of normal. Food-100%, water-100%, research-50%, energy-50%. Tier 4: Planetary Core Structures: Mineral output of Tectonic Drills increased to 500% of normal. Permanantly destroys any ancient artifacts on the planet. Research: This path yields successively higher research output per scientist at the cost of decimating water, food, production and energy output. Tier 2 and above requires a Toxic environment. All labs produce extra RP if placed on an ancient artifacts node (see Buildings). Tier 1: Hazard Lab: Research output of labs increased to 200% of normal. Tier 2: Biogenic Lab: Research output of labs increased to 300% of normal. Production-25%, energy-25%. Tier 3: Radiogenic Lab: Research output of labs increased to 400% of normal. Production-50%, energy-50%. Tier 4: Transgenic Lab: Research output of labs increased to 500% of normal. Production-100%, energy-100%. Defense: This path converts an outpost into a system-wide defence platform. Tier 2 and above requires a Molten environment. Tier 1: Ground Batteries: Weapons that can fire at enemy ships from across the system (ie into any combat occuring in the system). Tier 2: Plasma Cannon: Improved weapons. Production-50%, energy-50%, research-50%. Tier 3: Thermal Flux Emitter: Improved weapons. Production-100%, energy-100%, research-50%. Tier 4: Planetary Kinetic Cannon: Improved weapon. Production-100%, energy-100%, research-50%.